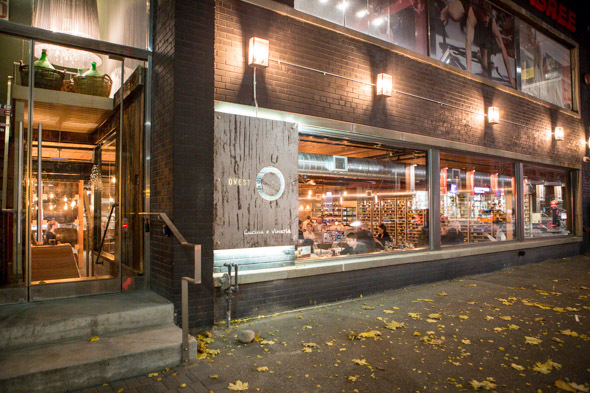 Ovest Cucina e Vineria is a massive (4,700 square foot) Italian restaurant on King West helmed by Sicilian chef Luca Stracquadanio (ex- Terroni ) and general manager, Marco Celio (ex- Buca ). The 120-seat restaurant occupies the sunken lower level and juxtaposes some of its natural industrial character - like concrete floors and exposed ceilings - with luxuries like built-in wine displays and an abundance of marble. 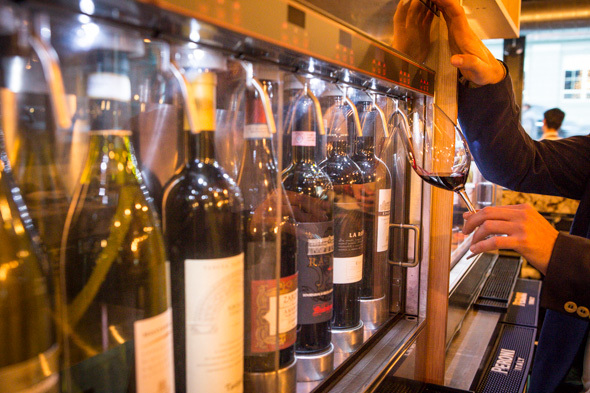 The marble bar and salumeria are focal points, and on Fridays and Saturdays, the ample by-the-glass selection of all-Italian wines ($9-$26 for a 5oz pour) is served with a complimentary selection of freshly sliced charcuterie and cheese. 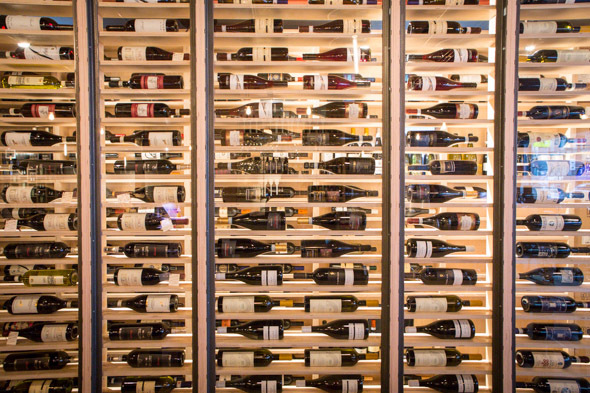 Being a full-blooded Italian, it's obvious that Chef doesn't feel any need to prove the authenticity of his cuisine - the menu is neither tied to any one region, nor does it rely on imported DOP products. He's excited to work with local, seasonal ingredients and to switch up the menu accordingly. 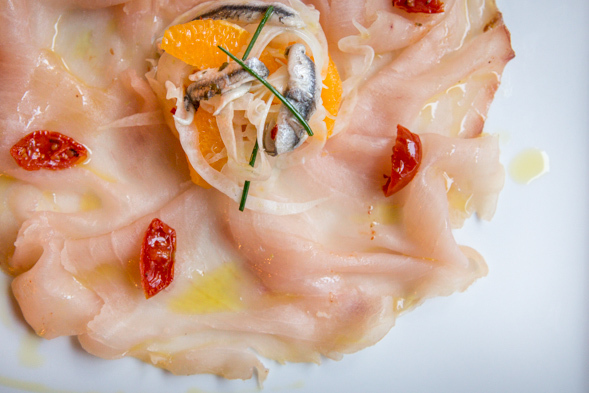 Chef's signature dish is the Carpaccio di Pesca Spada ($18), a smoked swordfish carpaccio with fennel and orange, white anchovies and dried cherry tomatoes, all doused lovingly in olive oil. I've never had swordfish like this before - it resonates with deep smoky flavours but the texture is soft a buttery like crudo. The fennel and orange complement with sweet bright notes. 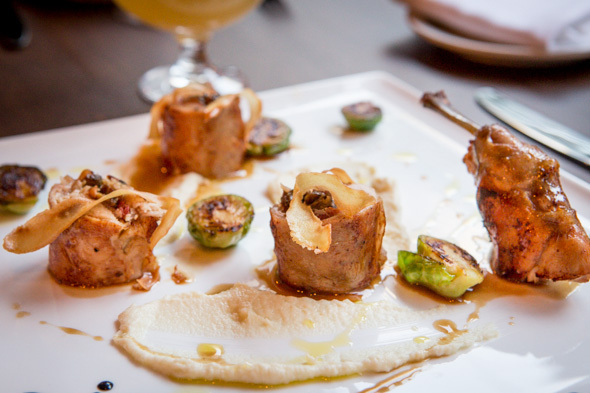 Going into winter, the menu taps into seasonal cravings for earthy, hearty fare. Nodino di coniglio ($28), a rabbit roulade, is stuffed with porcini mushroom and speck, served over cauliflower purĂŠe with roasted brussel sprouts and a roasted rabbit leg finished with jus. 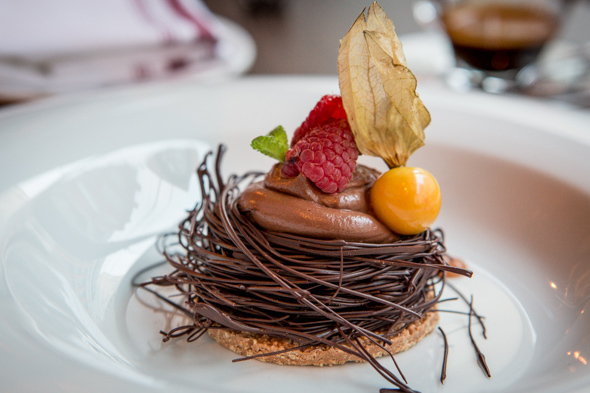 For dessert there is a chocolate mouse piped into a chocolate nest ($8) over a Ferraro praline crunch. This is such a rich dessert that chocolate-overload seems likely, and yet all the contrasting textures keep me coming back for spoonful after spoonful. Aside from wines, there are cocktails like the Tempesta ($14), a spin from bar manager Luca Casula on a classic Dark & Stormy. 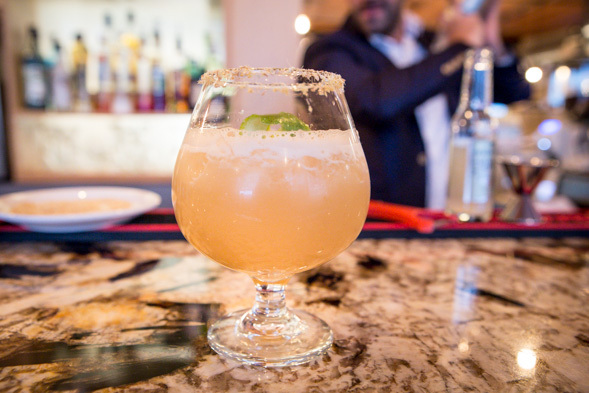 Rum blended with house-made five-spice and ginger syrup and topped with ginger beer is an effervescent beverage with spicy notes of cinnamon, fennel and Szechuan peppercorn. Ovest serves lunch on weekdays, while dinner service runs Monday through Saturday. Reservations are welcome.